Our team of instructors bring expertise in their academic subjects and actively seek to build relationships with students to help them become lifelong learners. Our “Robin Hood” model allows us to provide high-quality services to all families and students: we use the funds we receive from families who can afford paid tutoring services to support families who cannot. In the summers we are proud to bring the Community Reading Buddies Program to Oakland Childhood Development Centers. 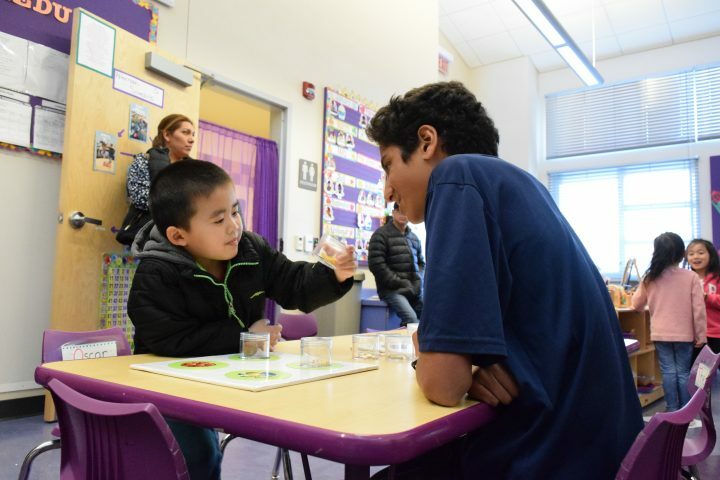 CRB pairs high school mentors with preK-3rd grade students to practice literacy and social-emotional skills. With your help, we are committed to expanding our educational services to more students who need them but whose families cannot afford the expense. Your donations help to expand our one-on-one tutoring scholarships and to bring Community Reading Buddies to additional classrooms each summer. Please join us in providing equitable educational services to our communities. Both tutors my daughter saw were amazing. They were very different but both connected well with her. Jennifer was so calm it helped my daughter with the ISEE prep so she did well on the ISEE. And our second tutor challenged her to think for herself; her report card went from 3 to 4 in math. During the time spent with the Reading Buddies program our children were more engaged with literacy and now seem to spend more time in our library. Both of my children were preparing for the ACT as seniors and I was late looking for tutors to help them. Within about 6 weeks the Aspire tutor was able to help them improve their scores by 25%. I highly recommend Aspire for any youth studying for their ACT or SAT! My buddy started off very shy, he didn't seem to have a lot of interest in reading, he was mostly letting me do the reading for him. But as time went on he started to pick his own books, read more, read himself more rather than having me do all the reading, and he seemed to have a lot more passion about reading. From the beginning, it was clear that Joseph’s reluctance to work stemmed from insecurity, not insolence. He had the capacity to succeed, he’d just never had the time or support to absorb these concepts at his own pace. Not only was I able to give him this time and support, I’ve also been able to fortify his confidence as we’ve worked together over the past couple of months. Buddy Perspective: What do you like about your reading buddies? My two reading buddies are the best reading buddies and they're like sisters to me and they treat me very well. Katherine started with Aspire as a parent of two students at Head Royce School. After realizing the quality of our tutoring services, she began recommending us to other parents in her network and later decided to sponsor OUSD students for individual tutoring. Her contribution has ensured that more students of all backgrounds access the support they need to succeed.